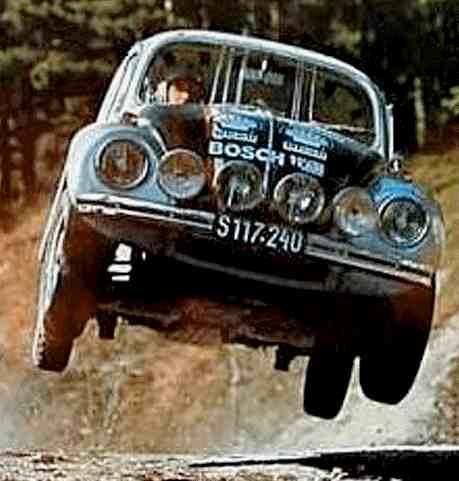 TheSamba.com :: Vintage Speed - View topic - 58 beetle from stocker to period styled rally car build. 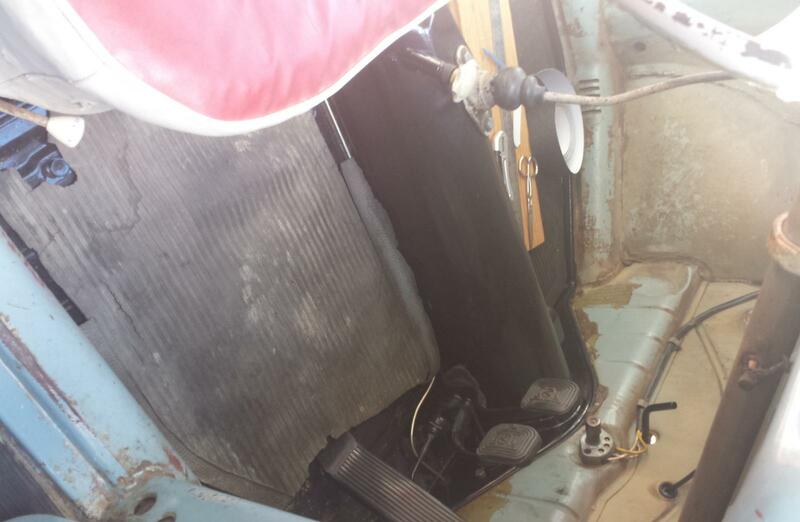 58 beetle from stocker to period styled rally car build. 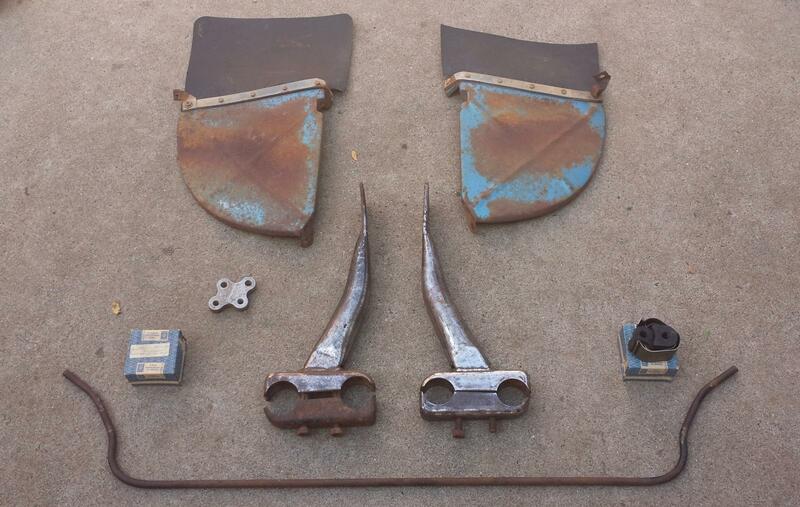 Posted: Mon Nov 17, 2014 2:18 am Post subject: 58 beetle from stocker to period styled rally car build. I figured this is the most appropriate forum for this as I'm starting with a complete registered stock car and just modifying it. I plan on using it in historic navigational rallies, they are meant for more stock cars and are not classed as "speed events" so a roll cage is not required. as the events aren't timed, rather scored on observations made on the road and such, I'm hoping a slow beetle might have a chance against more modern and powerful competition. i was given the car as it sits. seriously. (thanks again simon) i told the previous owner that I'd only accept it if he took it back when he moves back to Australia, so i don't want to ruin it. I'm the 5th owner and the car has had 1 full and several partial resprays. the running gear was fully rebuilt (bar the gearbox) about a year ago to a very high quality (thanks NUG) but had only done a couple of hundred miles before I got it. the original engine was swapped out for a later model in the early 90's and for a while it was driven around on a slammed 56/7 floorpan with a WW okrasa, but it is back on it's stock height OG pan and has been fitted with a stock '60? 36hp. as it sits now. totally stock bar a 12V gen, white empi shocks and radial tyres (and a few slightly later parts I haven't swapped out yet). pics taken when i dropped my daughter's boyfriend home. a much nicer backdrop than my driveway. i'll start with the interesting stuff when i have some more pictures. the first mod done, fitting a butlers map light. note to self, find a torch when tinkering at night, even if it's just for a 10 second test fit. lighters melt holes in the headliner if you're not careful. here's some stuff I hoarded earlier. the speedpilot (average speed mechanical calculator) and the stopwatch are for redundant untimed navigational rallies, but I already had them and I like them so they will go along for the ride. this is basically functional now but needs a few last things to make it 100% finished. inc getting the clock serviced because it stoped working last month. the 2 extra gears are one up and one down from the X gear fitted to allow the twinmaster to be calibrated to the rally setters mile. the gearing currently fitted is a 136 X and a 39 Z gear on 165-80-15 tyres, I haven't checked the calibration on the road yet but it calculates out the as close as you can get with the gears available. 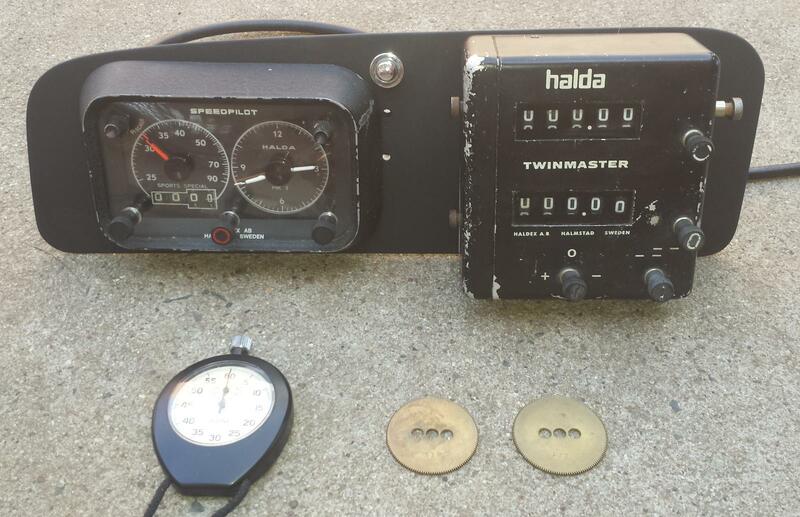 I calibrated the speedpilot to the speedo, but it needs to be adjusted slightly to match the twinmaster as the speedo is slightly out due to tyre size. this doesn't live in the car as I'm too scared of it getting pinched. it took about 4 years of watching various auction and classified sites daily to find all the necessary halda bits at affordable prices. a few bits to go under the car. factory front beam stiffeners. 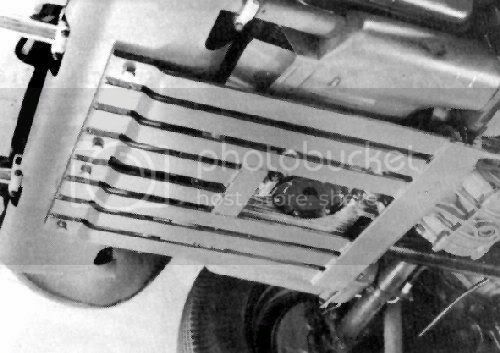 standard parts set SP 401 "set of additional front axle supports" to stop the front beam flexing/bending during heavy use on bad roads. no idea on the maker of the mud flaps, but they are very well made and fit nicely. 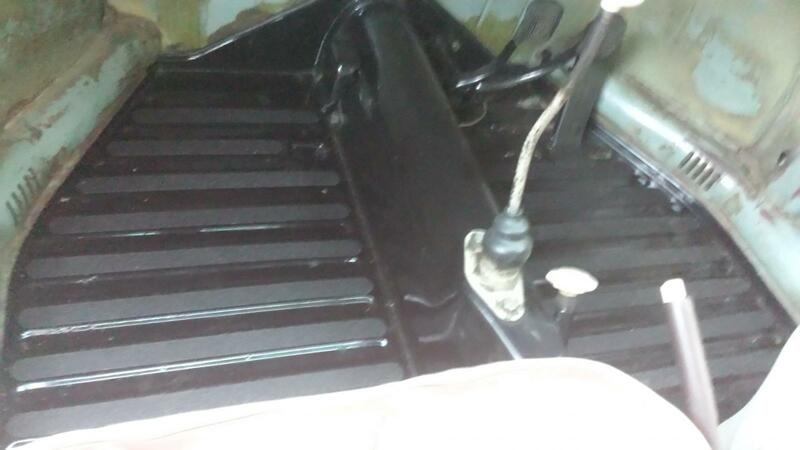 I spent 3 hours driving all over town last week looking for ribbed rubber to replace the dead flaps and mimic the VW Australia accessory mud flaps, with no luck. not sure if I should settle for plain rubber or chase the dream. 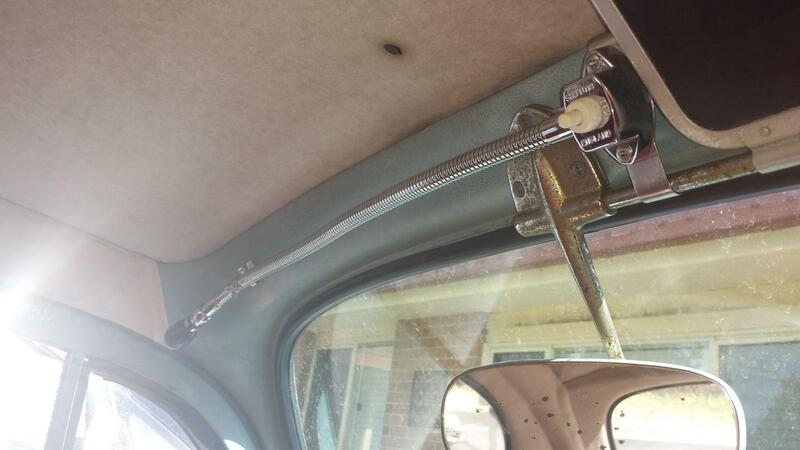 '58 models didn't come with a sway bar, after a lot of thought and reading I'm going with a stock sway bar to match the skinny high profile tyres and rough roads this will see. ideally it would be a ex-kg humped sway bar, but I don't have one. if it turns out not to handle well there are 17 and 19mm bars in the shed to try. once things are better sorted I might try the quicksteer, only time will tell. a 36hp Monaro motors kit I had hoarded awaiting the right car, it still needs aircleaner elements and the carbs desperately need a rebuild, thankfully there are kits available that include new throttle shafts and bushes. 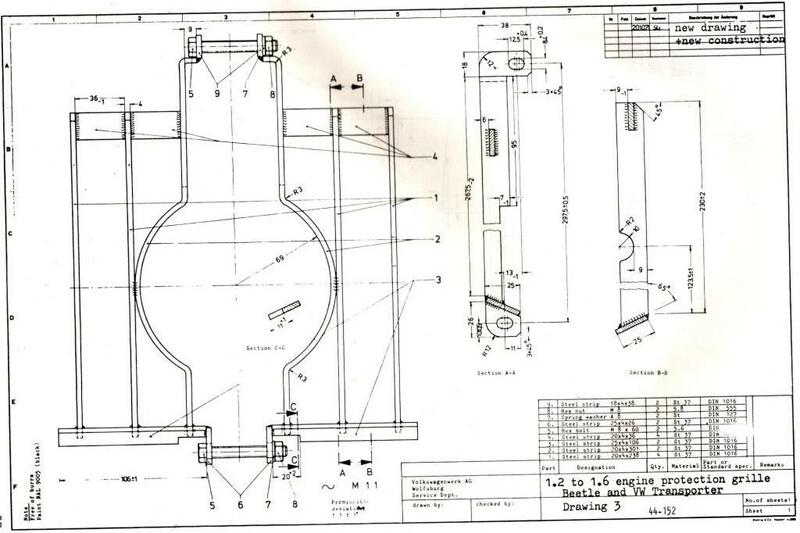 if anyone knows a source of the flat elliptical bell mouths for 1 1/8" SU please post it. the cibie oscars won't be going on straight away, I'm enjoying the totally stock look of the car as it sits. when I do need to fit them I plan to make an easily remove-able mount. I'm still not sure how many I will end up running and where either, until I dug them out today I would have sworn I had two pairs not 3 and 1... something else to look for. marchels would look more correct for a '58 beetle, but i'll use what I have, plus I love the look of cibies with the factory black metal covers, as per bob beales' rally beetle. the covers are reproduced but will have to wait as there are more important thing on the wants list. the distributor is a VJ4 BR8, disassembled for rebuild. I have a BR25 as well but I think this will be more suited to a mild 36hp. the bosch light might end up as a reversing light, haven't decided yet. looking at all these parts to add makes me shudder thinking about all the extra weight my poor 36hp will have to move about. Wanted: Art Collins VW (Savannah, Georgia) items - license plate surrounds and other items. Also ivory "AM", "FM" and "SW" buttons for a US Blaupunkt Frankfurt. this looks like a great project! don't go overboard with fog lights, less is more! I'd go with the BR25, it has the same curve as the Bosch 010. If you need help with them, i'd be happy to supply parts or rebuild either. I'm really not sure how many driving lights I will run, at the moment I only have a 12V 25A generator. stashed away, there is a 38A 12V small size gen and a split kombi 45A 6V gen (putting the armature in the current 12V generator should give me about 37-38A 12V. for the time being buying a new regulator to suit is an un-necessary expense so the 25A will stay a little longer. thanks for the suggestion glenn, you might hear from me about a shim/washer kit too. I gave the car a long overdue wash and wax today and noticed I have already picked up a rock and cracked one of the scripted bosch headlight lenses. at least it wasn't the VW logo'd lense. 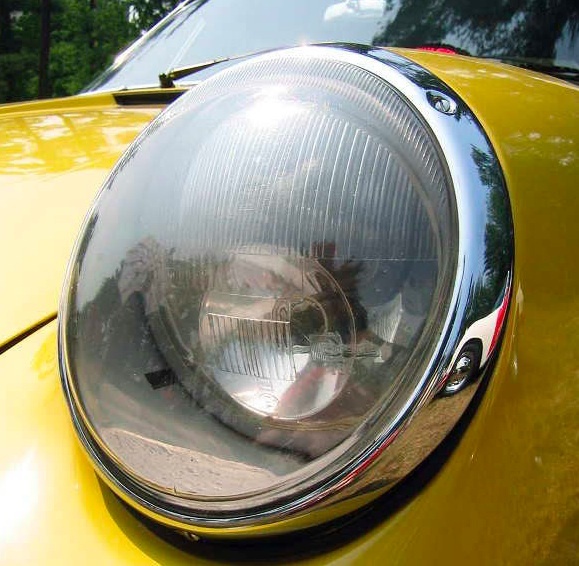 I'm not sure what to do from here, incorrect headlight lenses/headlights are one of my pet hates, but breaking 50's fluted lenses could get very expensive very quickly. it's crossed my mind to take a mould of each side of a lense then try to press heated lexan between the two moulds to make lexan copies, but I have far far more ideas than I have motivation. mind you, if I could find a set of these VVV at an affordable price, I'd find a way to deal with the incorrectness issue. cibie biode lights. 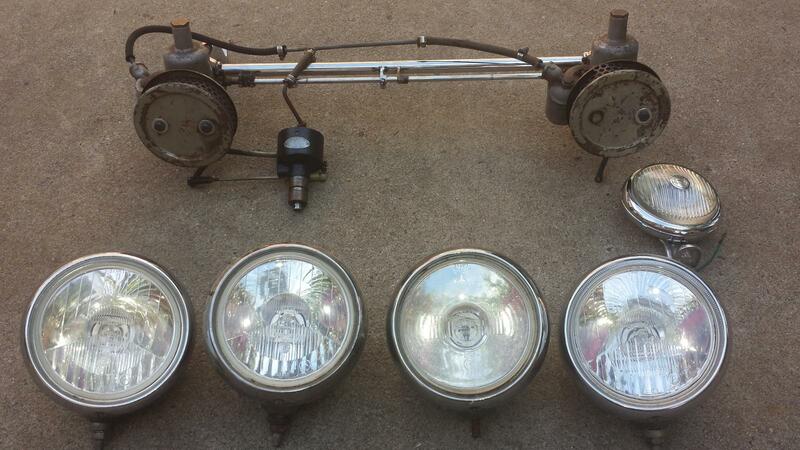 they came in both headlight/spot and headlight/fog versions. marchal did something similar but they aren't as nice looking IMO. as an aside, of course as I was wiping the wax off the last panel my wife suggested we go out to the local dam for a swim with the kids and some friends. 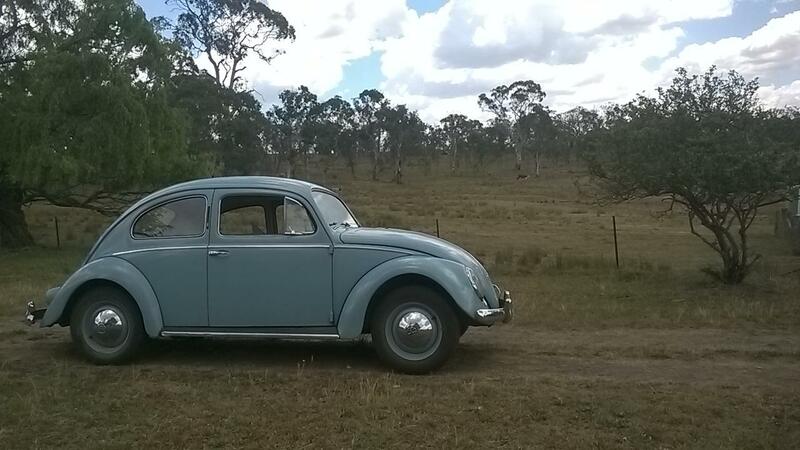 who could resist taking your beetle out for a drive in the country on a warm spring afternoon. the only problem being there is just enough dirt to get a covering of dust on the car again. Are you trying for something like this? I love the salzburg cars, but that look is a little too modern, plus the car and my skills aren't quite to the stage I want to get that much air yet. I've done that a few times in my youth but now I'm older (and slightly wiser) I'd need to work back up to it. a very rough mock up of where i'm heading. the car didn't come with floormats but thankfully a friend had given me some for the green std beetle in the driving light pictures above. (thanks dion). in total there was 4 or 5 mats but no front drivers side. 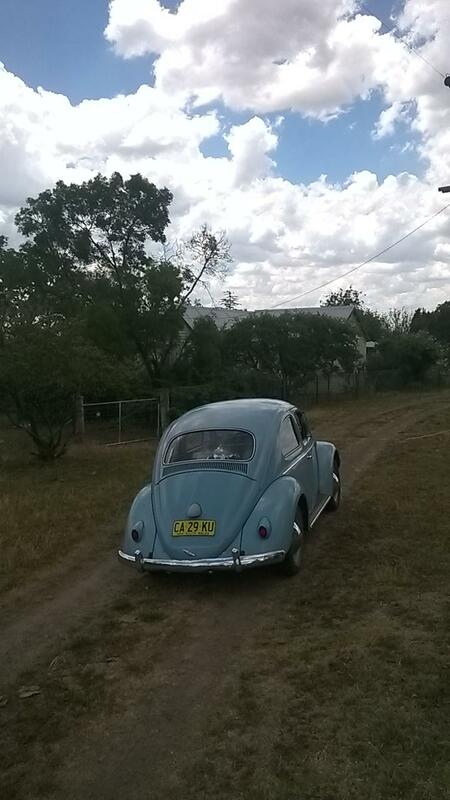 I ended up going out to another friends who had a heap of 6v beetles hunting for one, none of them had the correct matt so I chopped the drivers floor remains off a early 60's 1 piece matt. (don't worry it was already stuffed) it did the trick but is slowly getting smaller and smaller as bits break off. something needed to be done. the options were find an original which virtually never come up for sale over here or try to get a repro RHD oval set which go in and out of production, aren't cheap and would need to be hacked to fit around the pedals. + floor matts are heavy and I don't want to pay lots of money to make myself go even slower. I doubt it's period correct but it works for me. 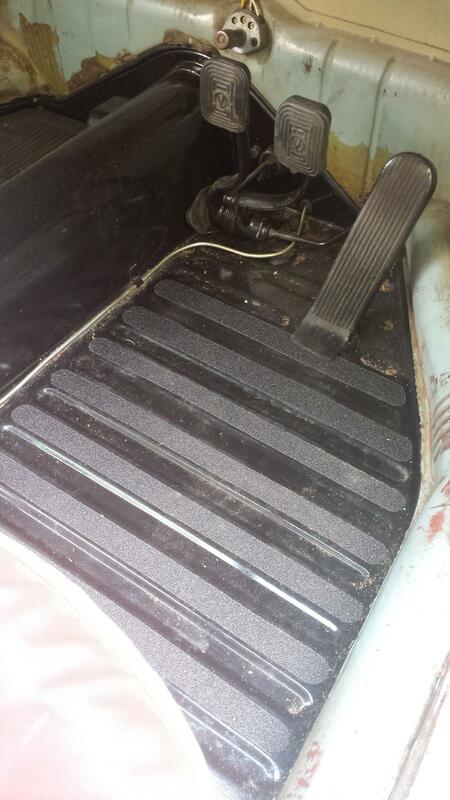 for now I will keep the front floormats in for everyday use, but for events they can come out. it should help protect the drivers matt too as it is the sliding around that is destroying it. of course I have to do everything the hard way, so it took 3 times longer than I thought it should, but I'm happy with the result... it gives good grip but isn't too rough to drive barefoot and looks ok too, IMO. done for now: sorry about the blurry pic. for now the co-driver won't get a footboard as just bringing your feet back to near the seat brings your knees up to a good position for resting the map board on. Are you planning on running a sump guard front and back? I'm planning to add both front and back plates at some stage. I've looked at the drawing you posted before and always hoped someone had a plan for the earlier version, if there is one. if not i'll just make a cardboard mock up from the plans and adjust it till it fits. for the back I'm unsure, I'd love a full length alloy engine / gearbox plate, but I'm not sure if/when that will happen. but I have a friend with a couple of factory tow bars so if I can bring myself to add the extra weight, i'll save up some $, then fit one for now. edit, Zebedee, I just realized why your name looked familiar... I've read the VZI rally beetle thread end to end several times looking for ideas. That thread on VZI if full of great piccies. I think i've posted up the majority of my photos in there. Factory towbar seems like a pretty good mod and can have a plate installed under it too if you feel like adding even more protection (and weight). 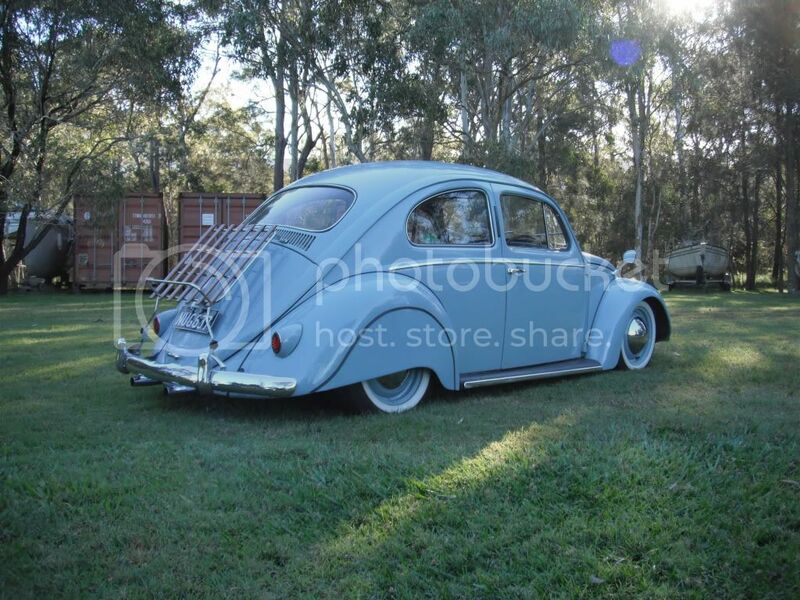 I'm still in two minds as to what to do with my beetle when i eventually finish it. I'd love to compete in historic rallys but think i'd cry if i stacked it into the trees or put it in a ditch. noce work henry, looks like a country buggy bash plate too!! This looks great Henry, keep the updates coming! What style muffler/exhaust will you go with? thanks mildoval, you will remember this car from it's past life (on the slammed oval pan) as nuggets "bumhole". unfortunately the paint didn't like living by the sea, then some time it spent under a tarp. the climate where I live finished it off... so it's a shadow of it's former self as far as presentation goes. the updates will only be in fits and starts as things progress. 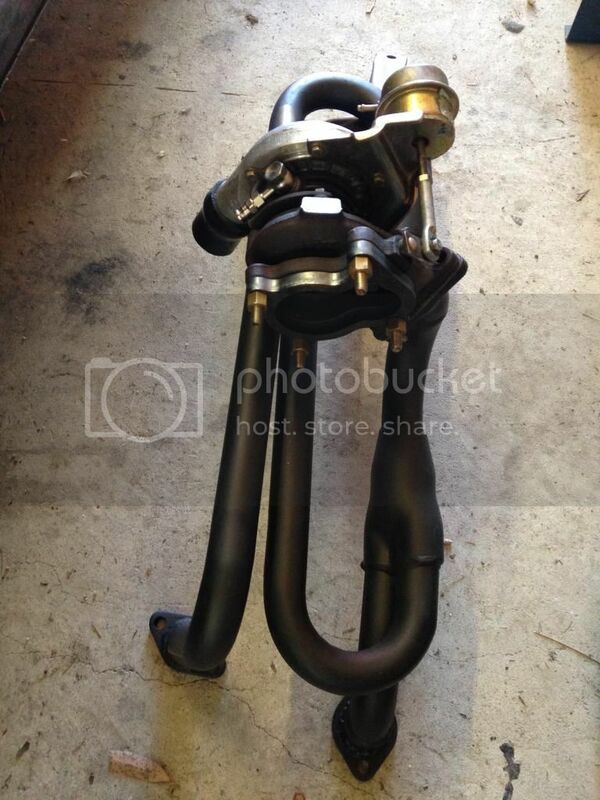 the exhaust will be standard for the time being, TDE tailpipes are on the cards though. I may be getting a set of period sonic 4-2-1 extractors to try out at some stage too. 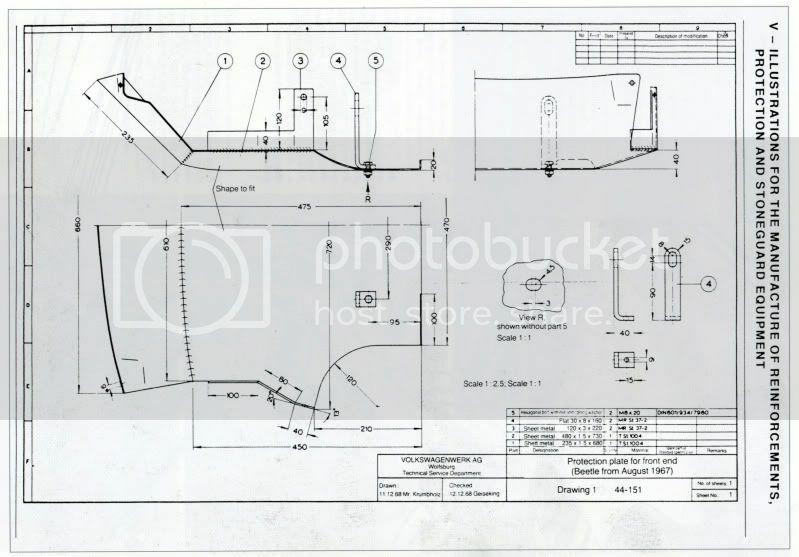 there are further plans but they are a long way down the track and part of a full engine build, so will come out if that actually happens. I may be getting a set of period sonic 4-2-1 extractors to try out at some stage too. you offered me yours, but I'm an enabler and I'm going to try to convince you to add one of these to your PGSG. No worries, I know how these projects take time.... but I can't wait to see that Monaro Motors kit going, it's the ultimate Aussie Old Speed bling!